The first church at Caborca was built soon after October 1694, when Jesuit missionary Francisco Xavier Saeta became its first priest. Father Saeta was martyred in an O’odham uprising in April 1695, and two months later both his house and the church were burned. In 1698 repairs were made on the buildings, and between 1702 and 1706 a replacement church was constructed with the help of carpenters brought to the site by Father Kino. By 1730, however, it had apparently fallen into ruin because Caborca, then a visita of Tubutama, was said to be without a proper place of worship. 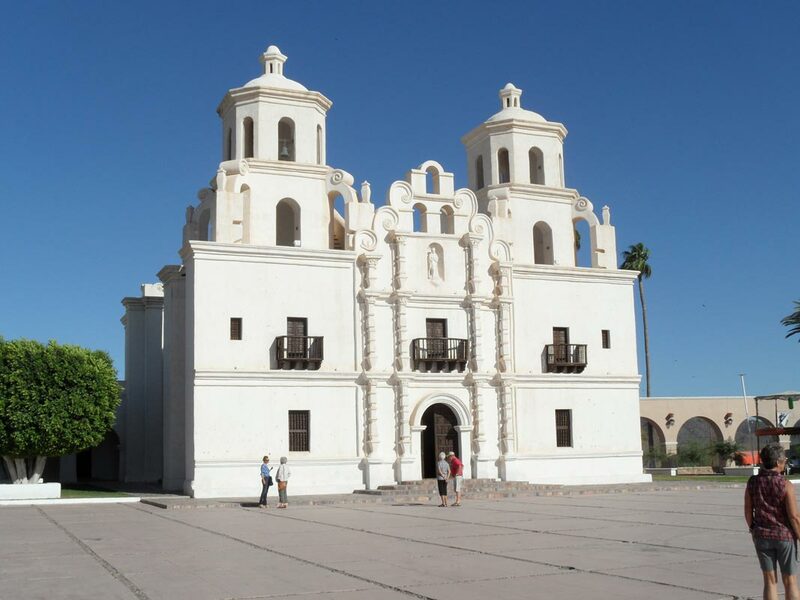 It appears that sometime between 1743 and 1749 a third church was completed at Caborca, one also destined to be heavily damaged—if not destroyed—in 1751 during the Pima Rebellion, when Caborca’s resident missionary, Tomás Tello, was killed by the O’odham. 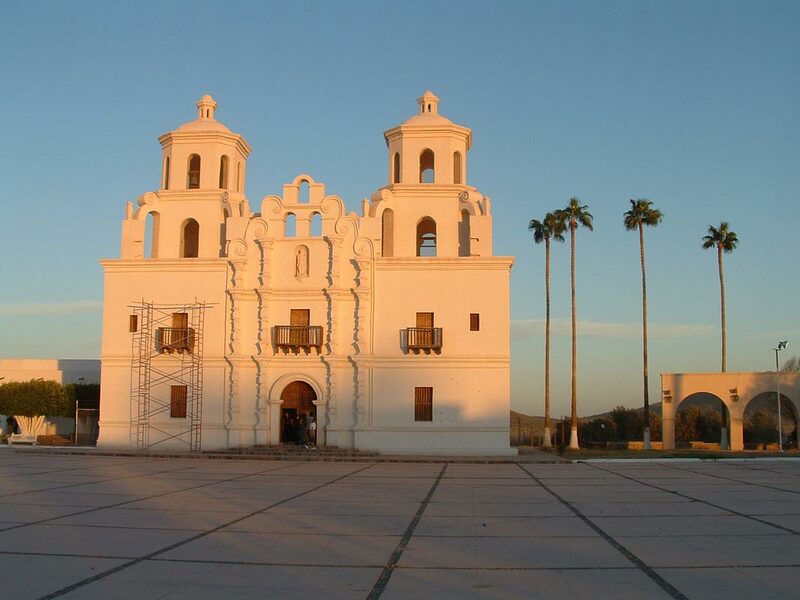 When Father Juan Díaz took over for the Franciscans in 1768, he described the Jesuit construction at Caborca as a partially destroyed building of adobe with a roof of straw and dirt. It was nonetheless the cabecera with visitas at San Diego de Pitiquito and Santa María del Pópulo—earlier San Valentín—de Bísanig. 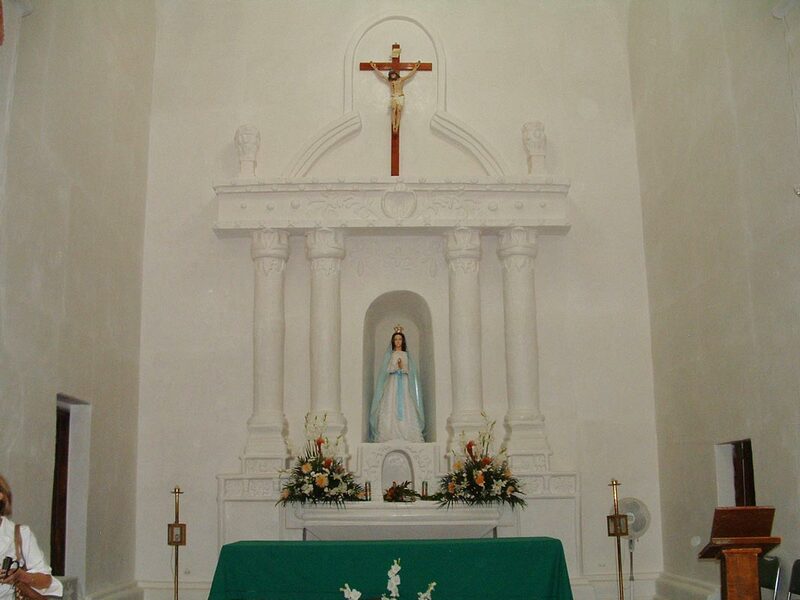 In 1772 the church at Caborca, according to Father Reyes, had both a sacristy and side chapel as well as a house for the priest. 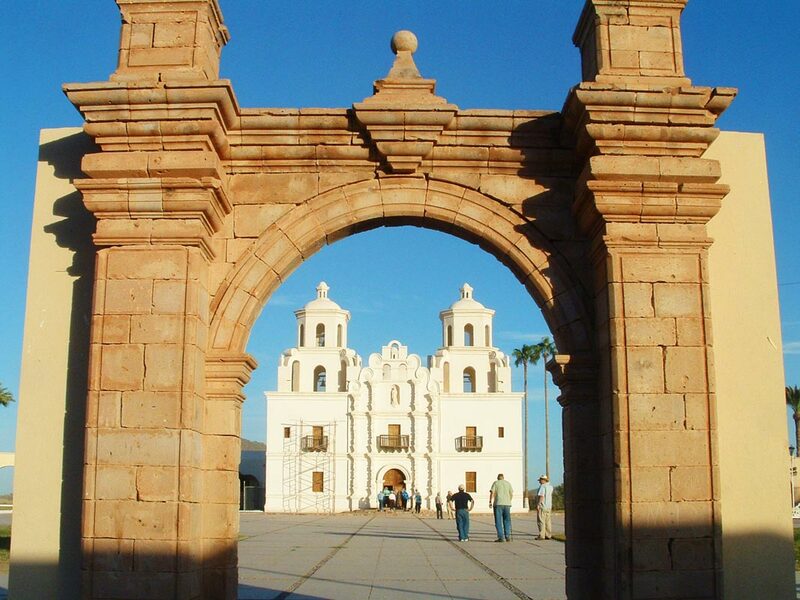 He wrote that in 1771 the missionary at Caborca had wanted to move the site of this Jesuit-built complex to higher ground where it would be less subject to flooding by the Río Concepción. Father Barbastro wrote in 1788 that by 1783 the temple at Caborca had been “beautified,” suggesting some Franciscan improvements on a Jesuit edifice. In 1792, he observed optimistically that Father José Mora, a man of “little schooling, but very efficient,” was following his order to begin a new stone and mortar house of worship at Caborca. As it turned out, Father Mora left Caborca in 1793. When Father Yturralde made his visit in 1797, the old building with a sacristy with adobe walls and a flat wood­-beamed roof was still there, although the floor was tiled. It was Father Andrés Sánchez who started the present structure no earlier than 1803 if a report written that year by Father Francisco Moyano can be credited. It was finished by May of 1809 under the successive administrations of Fray Santiago Usuastegui and Fray Saturnino Arizeta. 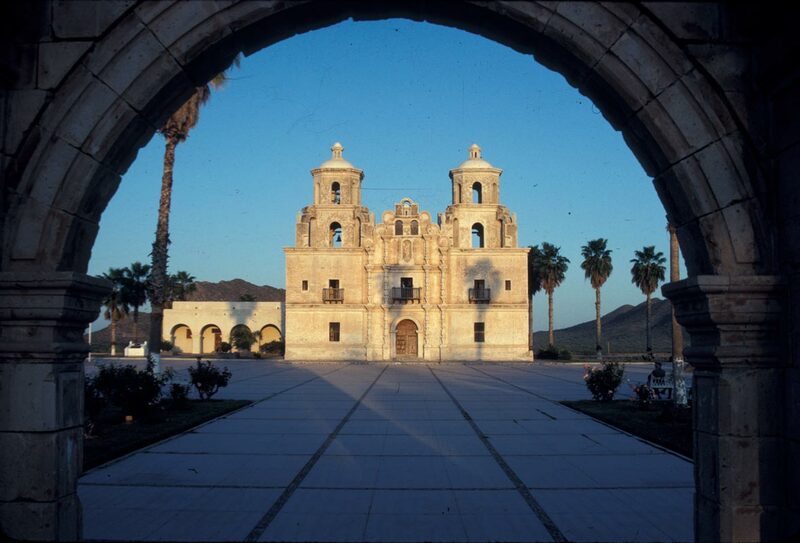 The principal builder at Caborca was Ignacio Gaona, the maestro albañil (mason/architect) who had done such a masterful job earlier at Mission San Xavier del Bac. 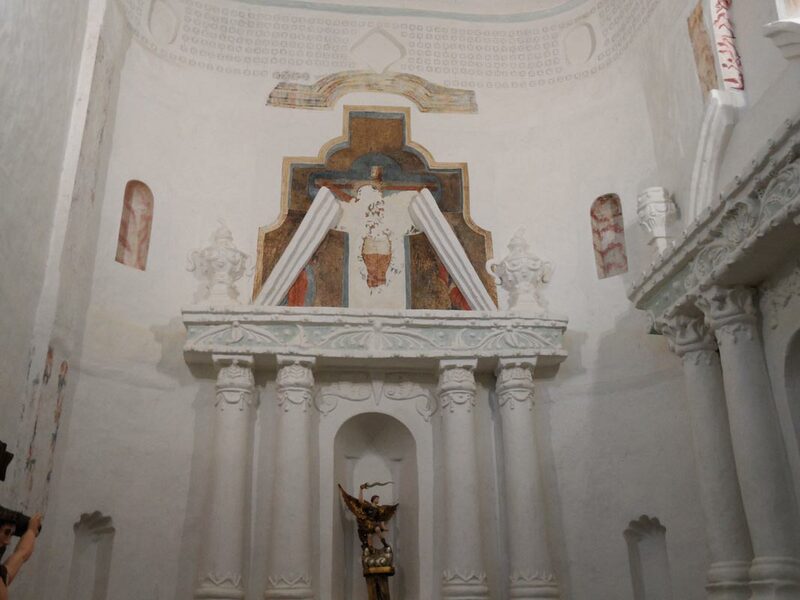 The person who executed the wall paintings inside Caborca’s church was probably Gordiano Escalante, a “master painter” resident in the town in 1811. 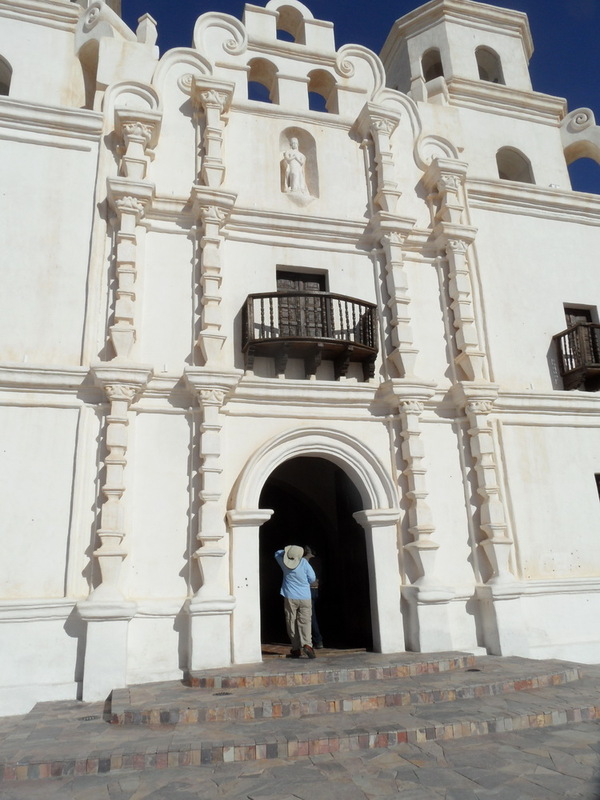 Given the similarity between the two buildings and the fact that Ignacio Gaona was maestro albañil for both, there can be no question that the Caborca church was modelled after that of the earlier San Xavier del Bac. 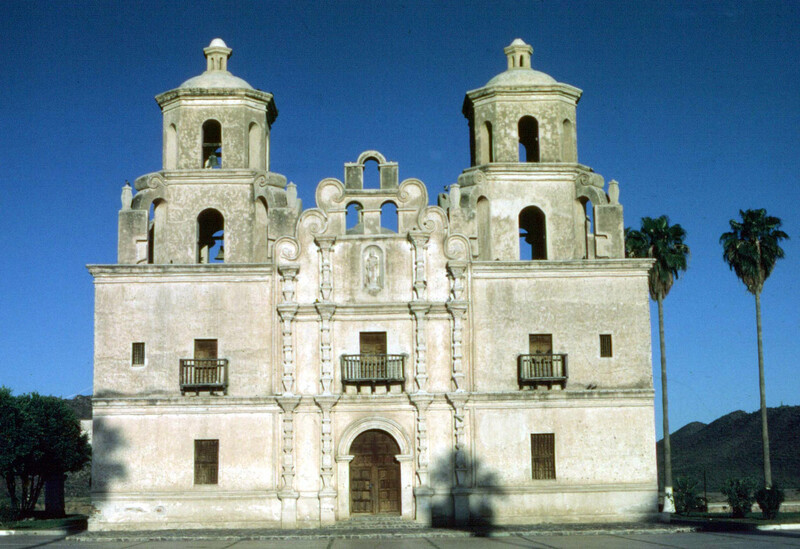 The somewhat less graceful, squattier appearance of La Purísima Concepción de Nuestra Señora de Caborca is occasioned by the fact that its façade is four feet wider and two feet shorter than that at San Xavier even as its twin towers are eleven feet shorter than San Xavier’s completed west tower. The interior of San Xavier (136 feet 6 inches long from portal to sanctuary rear by 21 feet 7 inches wide; 2,946 square feet) is larger than that at Caborca (129 feet 8 inches by 19 feet 2 inches; 2,486 square feet). These square footages are exclusive of transepts, sacristies, and spaces in the bell towers. General deterioration and damage from floods began to eat away at the rear of the church and its northerly convento wing beginning in 1890 when a room collapsed. A large room fell in 1899, and in 1915 the back of the convento and two more rooms closer to the main altar were ravaged. The sanctuary with its main altar was taken out in 1917. 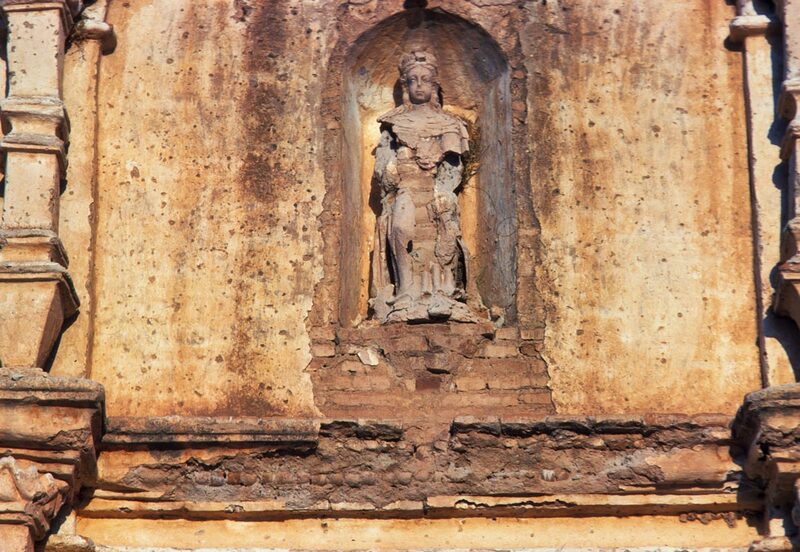 Restoration began in 1957 to mark the one-hundredth anniversary of the defeat of the Crabb filibustering expedition, but in January 1993 a flooding Río Concepción destroyed the rebuilt convento and most of the rebuilt north sacristy. Unless drastic measures are taken to re-channel the adjacent river, such destructive flooding is sure to plague this magnificent structure’s uncertain future.